Because we had the inside of the house painted, and many things had to be packed and moved and unpacked, I have been fondling my books, as one does. There's a stack to go to the daycare the girl attended, another for the library book sale (which isn't until June). There's a stack for my brother's little kids, and a box of children's books that I am constitutionally incapable of parting with. And as I shuffle, I reshelve. In some other lifetime, I may have been a librarian. A couple of my Edward Gorey books had wandered off from their special shelf, and I decided to alphabetize them, though I had to leave out The Lavender Leotard (because it's staple bound, and has no spine to show. Also, The Awdrey-Gore Legacy, which immediately precedes The Lavender Leotard, actually is a one volume edition of The Toastrack Enigma, The Blancmange Tragedy and The Postcard Mystery. I think it's okay that I filed it under Legacy. What? You don't file books by noun? Where is your imagination? It is presumably Craig Claiborne who advises that one serve this while listening to Benjamin Britton's Ceremony of Carols. And there you have it - my childhood writ small. George Balanchine, Benjamin Britten, Craig Claiborne, David Eyre and Edward Gorey. No wonder I alphabetize by noun. 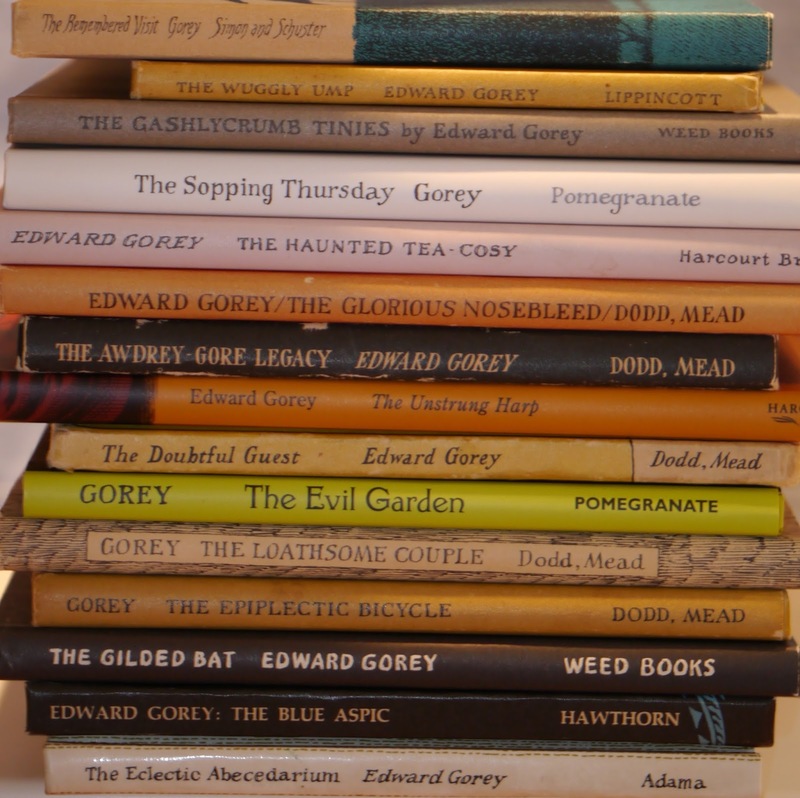 I envy your Edward Gorey collection. I am slowly finding old copies to buy but it is slow going. Edward Gorey can be categorized anyway you choose...as his work fits anywhere it is placed. Your childhood did have its magical (or is it whimsical?) qualities. Do you also have a Sendak collection? I saved many things from my children's preschool years and as they've gotten older, I let many of those same things go because they fail to conjure enough magic to compensate for their storage space. Not so my children's books. I saved ALL of them and even as my nest empties, I find they continue to delight me, make me smile, and remind me of some of wonderful ages and stages with my two.